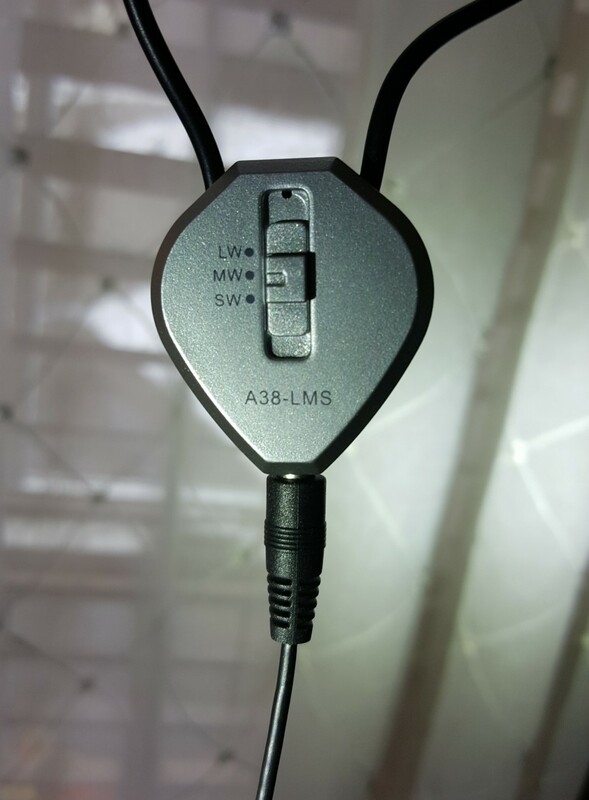 The Addwards A38-LMS is an active (amplified) Loop Antenna covering SW/AM/LW bands selling currently for $17.99 – $22 plus shipping depending on source. Even the most frugal radio hobbyist would have to admit that is downright cheap…if the thing works at all it would be quite a value…at the very least, a cool toy. It would appear to be an upgrade/replacement for the Degen/Kaito DE31/33 series of antennas which I have reported on previously. The basic concept is similar – the receiving element is a wire which is deployed in a square shape which is held in place by a metal support rod (actually it is a modified whip antenna but here it is used solely as a physical support…it is not an electrical part of the antenna system). The loop is hung by a hook or suction cup and is connected to the amplifier/control unit via a 16-foot cable. 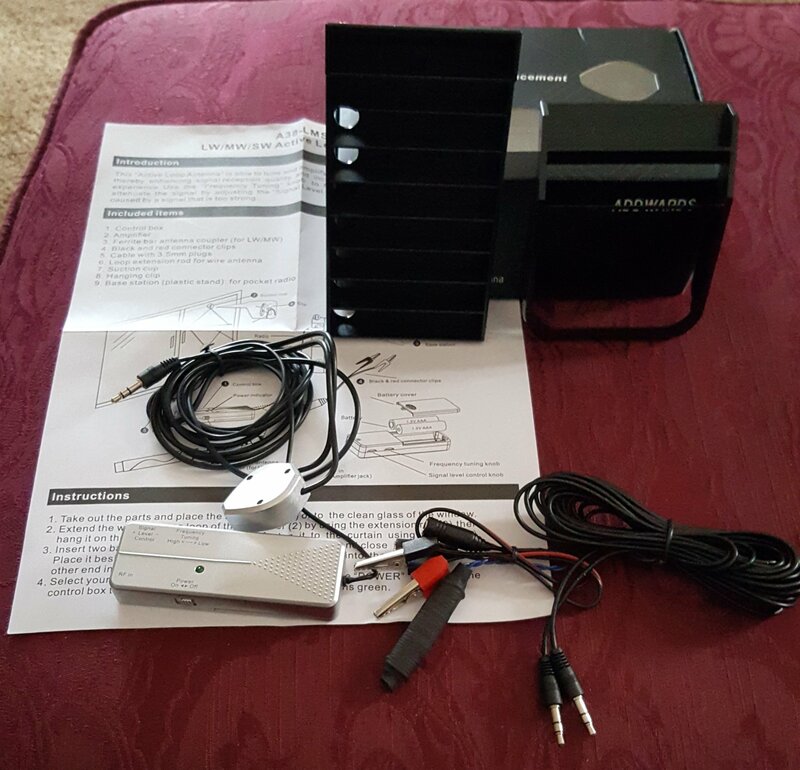 The control box has an output cable which can be plugged directly into radios with auxiliary antenna input jacks plus two adapters are provided; one terminating in a pair of alligator clips and the other which is connected to a ferrite sender unit which is placed near your radio to radiate AM signals into the radio’s built-in antenna. So far the description is similar to the earlier Degen units but there are some worthwhile upgrades and I’m happy to say this new antenna is a step forward overall. Improvements: In addition to the fact that the new antenna adds longwave capability the biggest step forward is usability…ease of use has been slightly improved, primarily because the tuning is now a little broader and therefore less critical. With the older antennas, the tuning control was SO pinpoint critical that many people mistakenly thought their units were dead because it was easy to skip right over the tuning spot without hearing even a blip…it was necessary to S-L-O-W-L-Y nudge the tuning thumbwheel until the signal suddenly jumped, then fine tuning was more of a matter of applying pressure to that thumbwheel rather than actually turning it noticeably. By comparison the Addwards tunes slightly more broadly – I think this design is a bit more user friendly…in fact the classic Sony ANLP-1 tunes very broadly like this even though it has click-steps. Another enhancement is the addition of a gain control thumbwheel which offers better flexibility. 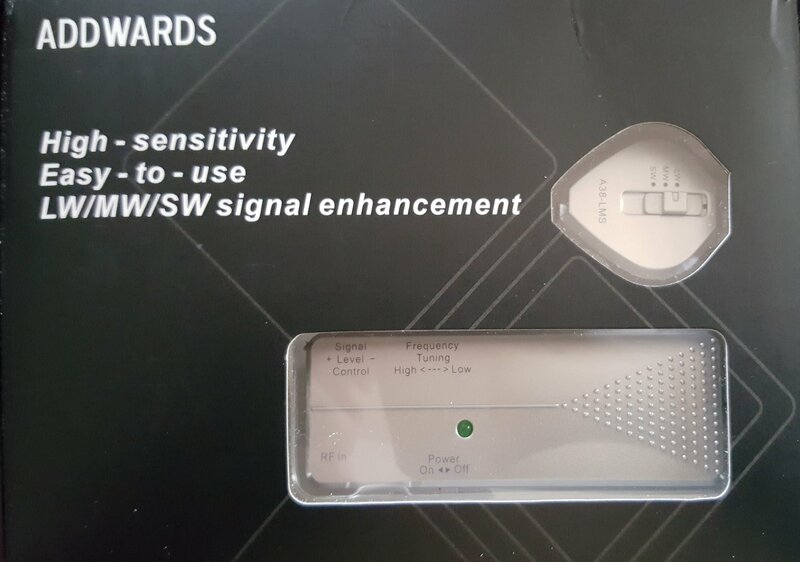 With it you can reduce the gain if you suffer overload from excessive signals. Another advantage I found useful is that you can use the gain control to achieve a more useful indication on the radio’s signal strength meter which makes tuning and aiming the antenna easier…the gain control is an improvement not available on the earlier Degen/Kaito antennas. 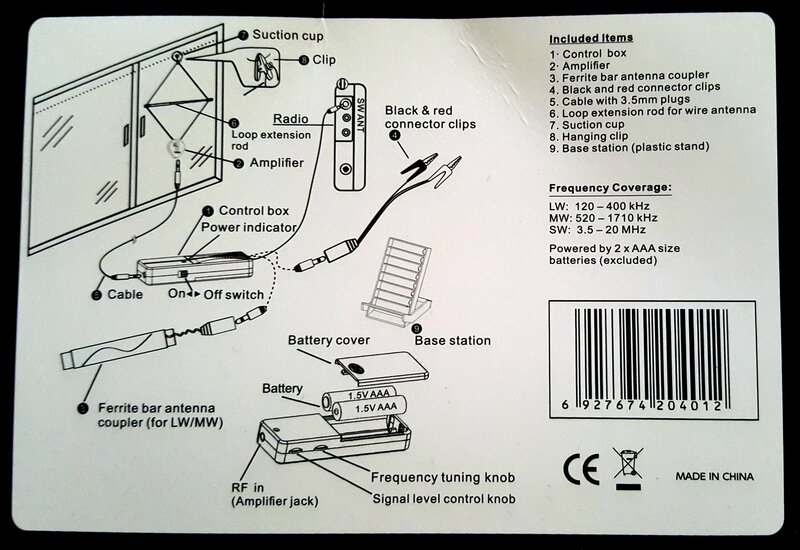 Yet another feature I really liked is the “Base station” (see the diagram on the box). 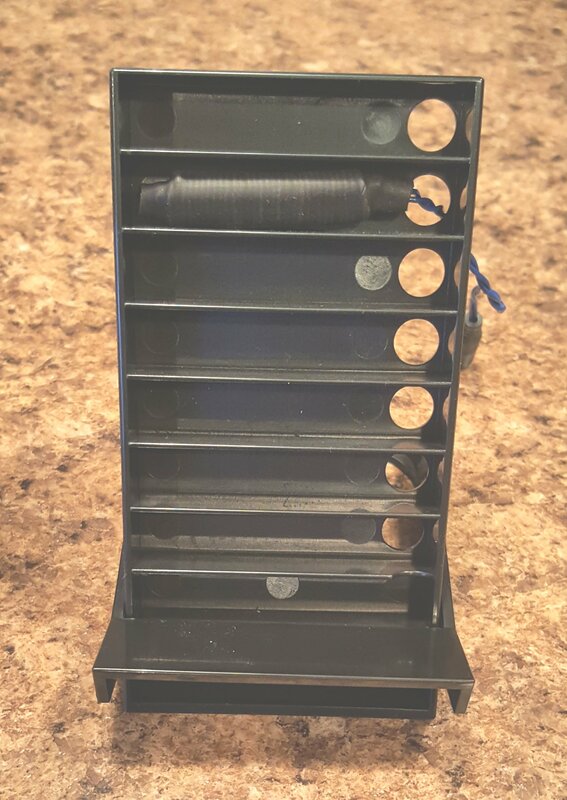 All it is is a plastic stand that holds the ferrite sender and allows a small or medium size radio to lean against it at a convenient angle. If you’ve ever found it difficult to find a way to physically attach a ferrite sender to a radio you’ll appreciate this…it’s such a simple idea yet so useful. Performance: For approximately $22 I didn’t expect much of the Addwards. While it certainly cannot begin to compete with much more expensive antennas such as a Wellbrook, Quantum Loop or C. Crane Twin Coil, it nevertheless can be a good tool to increase the sensitivity of a small to medium-sized portable radio. I tried it first on AM with a small vintage AM portable radio using the base station and ferrite inductive sender. It was simple to tune, the increased signal gain was very noticeable and the resulting reception on weaker signals was obviously stronger and cleaner…it worked exactly as I would have hoped. Tuning was not overly critical…the only fiddly thing is orienting the receiving loop in the best direction. Since you will generally use the supplied hook or suction cup to mount the loop you have to be inventive about where and how you hang it and of course the best position may vary from station to station. Be willing to experiment. I then tried it on several more sensitive radios ranging from travel-sized portables to my best reference portables. Generally, as is usually the case, the best radios were helped the least while lesser radios were helped more. On some stations the antenna actually made reception worse, other times it helped. The Addwards often raised the noise floor noticeably on good radios which is not good, but often by re-orienting the receiving element the signal was stronger ovealll with a resultant improvement in the final signal to noise ratio, but not always. Also there were curious images on some frequencies. An extremely weak station at 1700 KHz which could barely be heard was replaced by an image of a medium strength station on 660 KHz…this is not something that happens with better antennas. But as a tool for trial and error I’ve got to say it is a fun piece of gear and as I say, with more modest radios it can sometimes help quite a bit. Even radios with middling AM sensitivity such as the Sangean ATS-909X were helped noticeably with the Addwards. For SW I plugged the output cable into several portable radios of varying capabilities and again it often helped quite a bit. 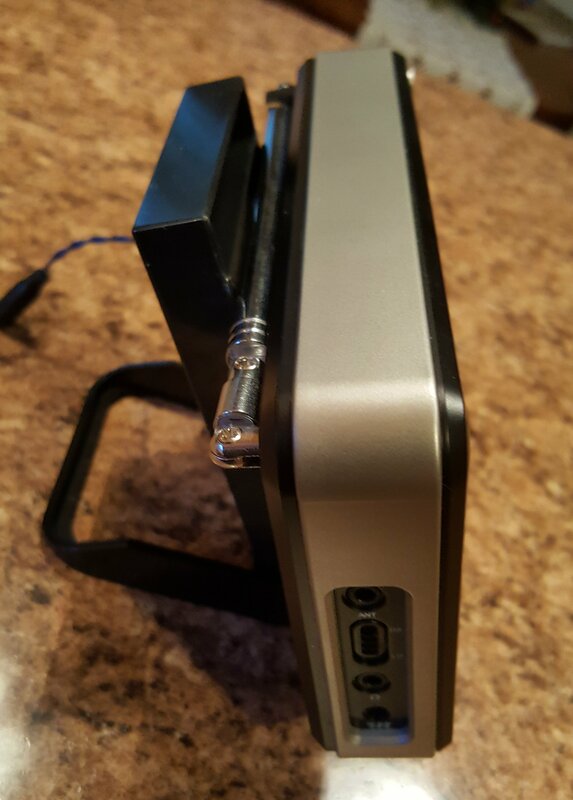 I would have to say that for the low price of this antenna it is worth having around as a tool that can sometimes help your reception quite noticeably. I also compared it with the older Degen DE31 and Sony ANLP-1 loops and I would rate the Addwards better than the Degen and about equal to the popular Sony (which you may remember cost around $100 several years ago, more today when you can still find one, and which covers only SW…no AM or LW. The Addwards is clearly a fantastic value. LW performance seemed a bit less strong. I found a few LW signals which were slightly boosted by the antenna but I will admit I didn’t spend as much time on LW as I did on AM or SW because I am not much of a LW fan. “OK. So you clearly think this is a cool little product for its crazy low price….it must have some faults, right”? Of course it does. Similar to the earlier Degen antennas I referred to there is nothing luxurious about the design of the unit. It is cheaply made. Mine arrived missing its suction cup. The Tuning Knob is a bit erratic…the signal can jump up and down with some static as it is rotated…I found I had to rock it back and forth a bit to get the sweet spot in some cases. There is no provision for storing the 16 foot lead-in cable between uses or when transporting the unit. My solution is to find some object to wind the wire onto or you may end up with a tangled mess. You could use the base station for this…a little reel of some kind would be a big plus but I must say that at this price I might be expecting more than is practical. The band switch for SW/AM/LW is at the base of the antenna unit rather than at the control box…that is probably unavoidable. Finally, and not surprisingly, it cannot compare with the much more capable (and expensive) antennas I compared it with. 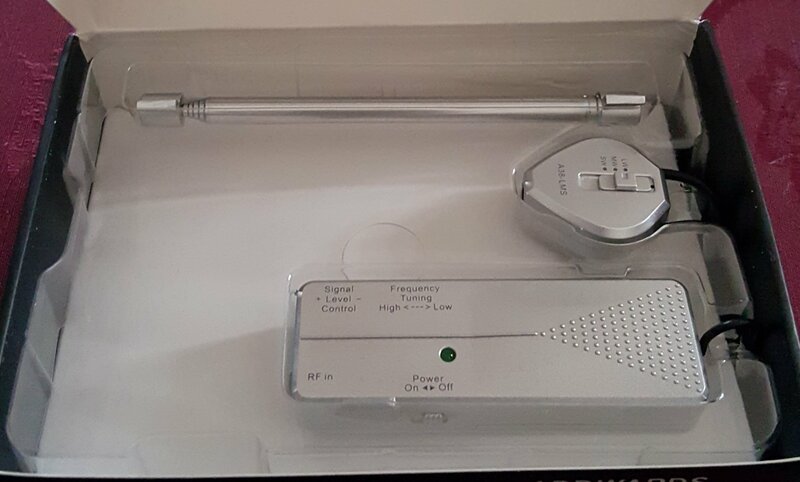 But it is certainly a great value and a versatile antenna and at less than a fraction of the cost of most radios you might use it with. It is fun to use and can improve your listening experience…and that’s what it’s all about.